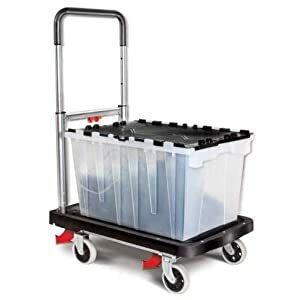 My husband and I moved to a new home recently, and this rolling hand truck “gadget” made the move exponentially easier. It totes up to 300 pounds, yet weighs less than 15 pounds itself, and collapses to a slim 3″x27″ for easy storage. We used it to ferry boxes around the house, to and from storage, to and from our cars, and to take trash to the dumpster. It has a slim price, too (under $70 on Amazon, and worth every penny). We’ll continue to use it. I know it will come in handy when setting up events, getting large/heavy purchases from the car to the house, etc. We’ve been stopped multiple times by neighbors at home and fellow patrons at our storage place who gaze upon it admiringly and want to know where we got it. I’ve got nothing to disclose here. I paid for the product, and while I’ve provided an Amazon link, it’s not an affiliate link. I’ve nothing to gain if you decide to buy one of these beauties besides your gratitude for altering you to its existence.